A former Nigerian beauty queen identified as Ronke Tiamiyu, took on her social media page to reveal why she will always fall in love with an Igbo man rather than a guy from her Yoruba tribe. Ronke, affectionately called Roney, who revealed that the Igbo guys are coded and cool to date, but a Yoruba man is the opposite, shared his experience with a man from his tribe where the relationship lasted just two months . She also revealed that she had already been to a Yoruba guy who was very ugly. Despite wanting to keep their relationship in a discreet tone, the man had already announced to all those who wished to listen that they went out together. This obviously did not go well with her and the relationship ended soon after. Tiamiyu's Snapchat post reads, "Seriously, I think the Yoruba boys are talking too much, no offense, I've been out with an Igbo boy in the same Lagos for two years and no one knows it. There are few of his close friends, the Yoruba boy I met after him in less than a week, the relationship was the city. 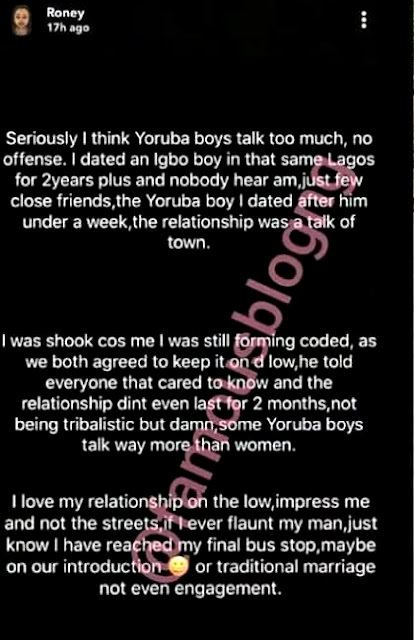 "I was shaken because I was still forming codes, because we both agreed to continue, he told everyone to know and the relationship did not even last two months, not tribal but some Yoruba boys speak more than women. "I love my relationship at the lowest, impress me and not the street, if ever I show my man, know that I reached my last bus stop, maybe during our introduction or traditional wedding not even commitment . "